John Lance Harris (born June 11, 1961) is a businessman, farmer, and cattleman from Alexandria, Louisiana, who is Republican member of the Louisiana House of Representatives for District 25, which encompasses the southern and western portions of Rapides Parish. He is the House Republican Leader. Harris owns the Leebo's chain of convenience stores. Harris attended the Southern Baptist-affiliated Louisiana College in Pineville and Northwestern State University in Natchitoches, Louisiana. He is the former chairman of the England Authority Board of Commissioners. 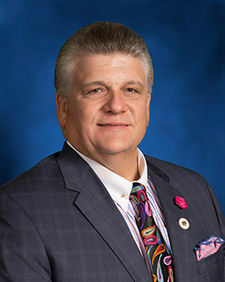 Reared in Pineville, located across the Red River from Alexandria, Harris is a graduate of the leadership program of the "good governmenjt" group, the Council for a Better Louisiana. He is a member of the World Trade Center in New Orleans, the Louisiana Restaurant Association, and the Louisiana Oil Marketers Association. In the nonpartisan blanket primary held on October 22, 2011, Harris defeated his only opponent, fellow Republican Barett Byrd, a retired colonel in the United States Marine Corps from Woodworth. Harris succeeded Democratic Representative Christopher Roy, Jr, of Alexandria, effective January 9, 2012. Roy, the older brother of Alexandria Mayor Jacques Roy, did not seek a second term in 2011. Instead, Roy announced his exit from the legislature so that he could spend more "Little League time" with his youngest son. Roy also said that he had grown weary of partisan divisions, particularly during the 2011 controversies over congressional reapportionment and legislative redistricting. For the first time ever, Democrats in 2011 did not offer a candidate for the District 25 House seat. Harris defeated Byrd, 7,577 votes (55.5 percent) to 6,088 (44.6 percent) to claim the position. Neither had previously sought public office. Byrd had been endorsed by the Louisiana Committee for a Republican Majority, established by U.S. Senator David Vitter with the goal of increasing Republican representation in both houses of the Louisiana legislature. Byrd also carried the backing of the Louisiana Republican Party, the Rapides Parish Republican Executive Committee, and the website LouisianaConservative.com. Neither Harris nor Byrd was endorsed by Governor Bobby Jindal, who was himself handily elected to a second term in office in the 2011 primary. In a special legislative session on Memorial Day 2018, Republican Majority Leader Harris obtained House passage of his legislation to keep one-third of a one-cent sales tax scheduled for expiration. The one-third part of the tax is projected to raise $369 million annually, less than the $648 million of additional revenue sought by Democratic Governor John Bel Edwards. A supermajority was required for passage of a tax, 76-26, as it developed with passage on the second attempt. Harris said that his bill would reduce government spending by 1.3 percent next year because it would still require some cuts, "but not catastrophic" ones. Then the state Senate added other tax increases to Harris' House bill, and the House declined to go along with the Senate. Harris' leadership against Edwards' tax proposals drew the fire of an irate long-term Rapides Parish Sheriff William Earl Hilton, a Democrat born October 12, 1945, who was reelected with 75 percent of the vote in the 2015 nonpartisan blanket primary against three Republican challengers. Hilton referred to the possibility that ten thousand state prisoners could be released if the cuts required by the recently approved state should become a reality. Hilton placed responsibility on Harris: "Lance has got it in his craw that this is what we're gonna do, and it's my way or no way. It's my way or the highway." Harris called Hilton's outburst more of "the worst political scare tactics I've seen." Ultimately, Harris lost out in his bid to restrain the 2018 state budget and keep tax increases at a minimum. Republican House Speaker Taylor Barras of New Iberia, who earlier had joined Harris and House Appropriations Committee chairman John Cameron Henry in holding the line on tax increases, suddenly reversed himself and joined with the Edwards administration to approve keeping .45 percent of a temporary one-cent state sales tax. ↑ 1.0 1.1 1.2 Byrd, Harris vying for open Louisiana House District 25 seat. Alexandria Daily Town Talk, October 13, 2011. Retrieved on October 24, 2011. ↑ Hazel re-elected in House District 27; Harris wins House District 25. Alexandria Daily Town Talk (October 23, 2011). Retrieved on October 24, 2011. ↑ Lance Harris for State Representative. electlanceharris.com. Retrieved on October 24, 2011. ↑ Byrd to seek Louisiana District 25 seat held by Roy. Alexandria Daily Town Talk, July 14, 2011. Retrieved on August 5, 2011. ↑ Rep. Roy opts for family time over running for reelection. Alexandria Daily Town Talk, July 20, 2011. Retrieved on August 3, 2011. ↑ Louisiana primary election returns, October 22, 2011. staticresults.sos.la.gov. Retrieved on October 24, 2011. ↑ A look at the La. races targeted by the Vitter group, August 4, 2011. nola.com. Retrieved on October 22, 2011. ↑ Jindal weighs in on Oct. 22 election. theind.com. Retrieved on October 24, 2011. ↑ Greg Hilburn (May 28, 2018). Breaking: House passes sales tax on second try. Retrieved on May 29, 2018. ↑ Election Returns (Rapides Parish). Louisiana Secretary of State. Retrieved on June 11, 2018. ↑ Melissa Gregory (June 8, 2018). 'Fed up': Rapides sheriff says he'll return state inmates if cuts come. The Alexandria Town Talk. Retrieved on June 11, 2018. ↑ The Moon Griffon Show, June 26, 2018. This page was last modified on 9 September 2018, at 00:07.